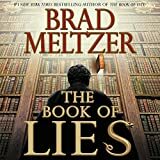 Brad Meltzer's Book of Lies is marketed as a thriller involving two rather different murder stories: Cain's biblical fratricide of Abel and the homicide of the father of Jerry Siegel (creator of the comic book hero Superman), occurring in 1932. The connection between these two stories, at the center of the narrative, is The Book of Lies. As the bewildered reader attempts to comprehend the storyline, this connection remains an empty sales pitch. More blatantly, the narrative does not deliver on its promise, and this improbable connection along a similarly improbable timeframe never becomes a realistic and credible possibility that unravels as the storyline reaches completion. Other troublesome features of this "thriller" necessitate mention. Perhaps the most damning one is the author's utter indifference to the notion that suspense intensifies through events that, although plausible and realistic, have multiple resolutions, all equally critical to the author's developed storyline. Plausibility generally results from background information given to the reader prior, concurrently, or after the events have occurred, whereas realism mostly results from the reader's ability to recognize events as capable of occurring, at least potentially, in his/her life or in the life of familiar others if the reader made suitable adaptations regarding, for example, residence, personal history, and socio-economic background. On the rare occasions when these two properties appear in one of the chapters, their application is so trite that the events related become easily predictable. The reader then leaves with the sinking feeling that the chapters to follow may present either of two possibilities: an unconvincing plot or a foreseeable one. If the narrative is mostly implausible and unrealistic, the characters remain, throughout the book, stereotypical, engaged in predictable and largely pedestrian diatribes. The two main characters, an estranged father and his enraged son, are unimaginative. They appear as cartoon characters or soap opera actors, unable to define themselves beyond a checklist of personality characteristics which the author has accidentally selected for them. Their dialogue centers mostly on their familial squabble and related feelings, making it a textbook case of mild domestic psychopathology, whereas their actions focus largely on finding a mysterious object called "the book of lies". Making sense of their actions and comprehending causes/motives and circumstances that prompt such actions is difficult. When father and son are not utterly predictable, their behavior becomes implausible. Namely, the author does not offer a comprehensible and reliable context to justify actions undertaken by his main characters. At times, the estranged father and easily enraged son stereotypes seem occupied in an unending string of adventures, running from one location to the next while avoiding detection by law enforcement representatives and by a psychotic criminal, as if they were action figures from an Indiana Jones film. Unfortunately, other characters in Meltzer's narrative suffer from similar, even deeper, weaknesses. Of particular interest is the character of the psychotic criminal, which epitomizes the author's difficulty in shaping original/unique fictional personas. This character seems to be a botched attempt to replicate the Opus Dei assassin depicted in Dan Brown's DaVinci Code. As a result, the reader does not crave more information for this character, nor attempt to guess his past and predict his future actions. The reader can passively await the storyline to offer information that he/she has already guessed. Obviously, the reader's passivity is not what one would expect from a thriller. The character of the female police officer suffers from another form of acute predictability. This character is so cliché that her actions and dialogues can be anticipated from the beginning of each of the chapters where she appears. Rather than from the respectable DaVinci Code, she seems to have been wheedled out of a soap opera. As such, the reader is not only deprived of any interest for the actions and motives of this character but also questions its relevance and suitability to the narrative shaped by the main actors. Many ingredients are missing in Meltzer's narrative. As the reader dutifully moves from page to page until reaching the end of this narrative, individuals and events do not become more transparent, but rather preserve their obviousness and sketchiness. Any key link between the two murders never materializes into a realistic possibility, and the final pages of the book are likely to end as a meaningless and time-consuming homework assignment where the teacher never explains the intended purpose. In all fairness, the author's storyline offers his reader the possibility of entertaining a variety of endings, some more predictable than others, but all reasonably promising. Yet even this lonely glimmer of excitement cannot compensate for the dullness and disbelief created by the preceding pages of the novel.